Add a bit of heat to you favorite grilled barbecue ribs this year. So sweet, spicy and satisfying. Place the ribs on a baking sheet lined with foil. Rub the rack with a generous amount of the pork rub. Allow the ribs to marinade for 2-24 hours in the refrigerator uncovered. Remove the ribs from the refrigerator and allow to come to room temperature, approximately 30 minutes. Turn the grill on high. Place the ribs on the grill and cook for 3 minutes on each side. Turn the side burners to low and the middle burner off. Place the rack in the middle of the grill and close the lid. Cook the ribs for 20 minutes. Flip the ribs over and cook for another 10-15 minutes. 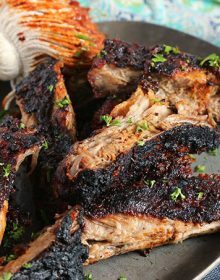 Coat the ribs with the barbecue sauce and cook for an additional 3-4 minutes. Flip the ribs and coat the reverse side with barbecue sauce. Cook for another 3-4 minutes. Transfer the ribs to a serving platter and allow to rest for 5-10 minutes covered with foil. Cut the ribs apart and serve with extra barbecue sauce, if desired.